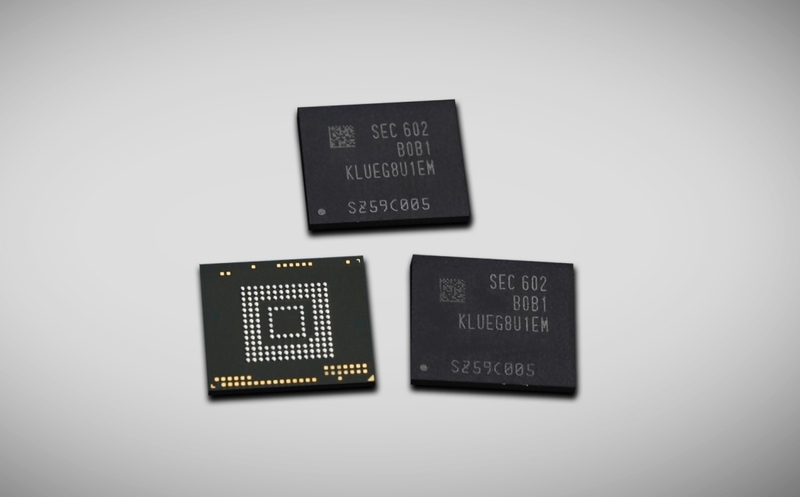 Samsung on Thursday announced that it is now mass-producing 256GB embedded memory chips for mobile devices. The chips, based on Samsung’s V-NAND technology, utilize the Universal Flash Storage (UFS) 2.0 standard and are physically smaller than a microSD card. Capacity, however, is only half of the story as the new memory chips are also incredibly fast. Samsung says they take advantage of two lanes of data transfer which allows for sequential read speeds of up to 850MB/sec. That’s nearly twice as fast as the average SATA-based solid state drive. They’re a bit slower on the write side as sequential writes check in at up to 260MB/sec. Random read IOPS (input / output operations per second) are rated at 45,000 with random write IOPS at 40,000. For comparison, Samsung says the previous generation of UFS memory was good for 19,000 and 14,000 read / write IOPS, respectively. The South Korean technology giant says one 256GB chip can store about 47 full HD movies. For smartphones that support USB 3.0, users will be able to transfer a 5GB movie in about 12 seconds. It’ll obviously take a little longer to transfer, say, a 4K movie, but it’ll still be much faster than what’s available today. It’s refreshing to see companies continue to push the limits of local flash storage, especially when you consider microSD card slots are becoming less common on flagship phones. Cloud storage is a solid alternative but it’s not a perfect solution as accessing it without a Wi-Fi connection will eat into your monthly data allotment (not to mention the fact that you can’t access it at all if you hit a cellular / Wi-Fi dead zone). Samsung said it will increase its production volume in line with increases in global demand.